This is the paperback version of the book, it will be shipped to you in the mail. 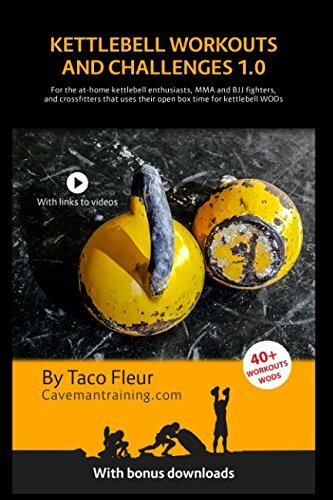 This book is targetted to at-home kettlebell enthusiasts, MMA/BJJ fighters, and crossfitters that use their open box time for kettlebell WODs. This book is even for budding trainers that wish to know more about the Cavemantraining programs and learn the basics on how to run them. 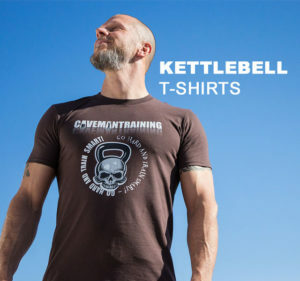 40+ serious kettlebell workouts, 4 kettlebell challenges, many are paired with very detailed videos. How to score AMRAP workouts. Finer details on most of the exercises. Quality emphasis on warming-up and mobility. Full details of the popular Thorax Workout included in this book. Additional ideas on how to make your WODs even more popular and exciting. Additional little tips and information for personal trainers. Each workout is 100% kettlebells, mixed with bodyweight, or mixed with other equipment. Some workouts will have alternatives or progressions. The title is prefixed with 1.0 as we’ll be putting out quite a few more books with new workouts. Information for trainers on how to run your own Caveman Circuit, and Boot Camp. Workout PDF that may be downloaded, printed and taken to the gym. Downloadable kettlebell grip PDF that will improve your kettlebell training instantly. Downloadable PDF that will improve your racking for resting and endurance. Free kettlebell workouts mobile app for the Android.